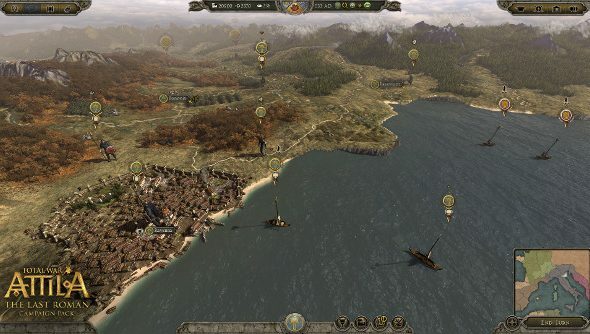 Total War: Attila was a revelation after the disappointments of Rome 2. I’m not sure I’ve seen another Total War game do such a good job of at once telling a historical story (the fall of the Western Empire) and giving you a good, open-ended strategy game to play at the same time. So I’m very excited to hear they’re releasing a new campaign pack, The Last Roman, based on the Eastern Empire’s heroic effort to salvage the situation and restore Roman rule under Byzantine governance. Creative Assembly have put together a pretty extensive video for their “Rally Point” series laying out the setting and the unique features of the new campaign. The big takeaway is that the campaign map is nearly the same size as Attila’s grand campaign map, but focuses exclusively on the Western Empire’s fallen territories in Spain, France, Italy, and Africa. This is a great setting for a campaign. It’s the last roll of the dice from Byzantium, a hugely ambitious attempt to retake in the space of a generation what had taken centuries to build. With a military genius, Belisarius, at the head of the expedition and the two of the greatest rulers in Byzantine history, the Eastern Roman Empire came shockingly close to righting the listing ship. With that backdrop, sign me up. I’m especially intrigued to hear that Belisarius’ expedition behaves as something almost akin to a barbarian horde, the better to depict the scale of the expedition’s ambition. With competing missions coming from the Emperor Justinian and his (probably far more capable) wife Theodora, you should get a taste of Byzantine politics and even dabble at playing kingmaker yourself. The Last Roman is available on Steam for pre-order right now for 10% off its regular $15 asking price. It looks like it comes out the 25th of June.